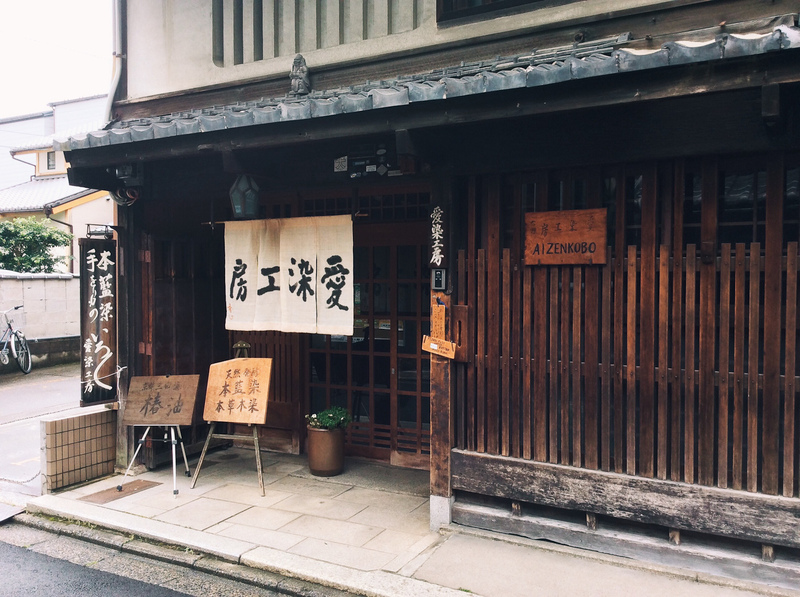 On my first day in Kyoto, I visited Aizen Kobo – an old indigo dye house / shop. It is situated at the front of the family home, and the master dyer still works and lives there. Aizen Kobo is the kind of store indigo dyers wished they owned. It is full of beautifully dyed textiles, and I would guess that around 25% of the textile bases used, are handwoven. On entering the store I was shown around by an older man who I took to be the master dyer, whose English was reasonably good, and he showed me a few different fabrics, some ikat woven, some plain indigo dyed and some shibori dyed. We discussed the shibori dyed pieces the most, and he explained that each different design is stitched by a different family. Most designs are unique to each family, however some will do a few variations of one technique. Some of the cottons were priced at around $45 per metre (if memory serves) and I think the silks began somewhere round the $110 per metre mark. Which to be honest considering the intricacies of the designs, and the effort involved in dyeing each piece made the price very affordable. It was a wonderful and interesting conversation and he talked about the difference in price not being just related to the different fibres, but also to how many dips in the indigo vat were required depending on the fibre. He said that cotton received around 80 – 100 dips, whereas some silk pieces were dipped over 200 times. Naturally I was incredibly fascinated by this point, but unfortunately I wasn’t allowed to take photos of the work, which was a shame but it is obvious that they want to protect their family business, and seemed fair. While walking around the shop we discussed dyes, and some of the work was not naturally dyed, however most was. It was easy to pick out the stuff that wasn’t naturally dyed. There was a large rack of sashiko thread however, and they were all naturally dyed. Despite my frustration with hand stitching anything, I was unable to suppress my desire to pick some up, so I grabbed more than any non hand sewer could ever need! 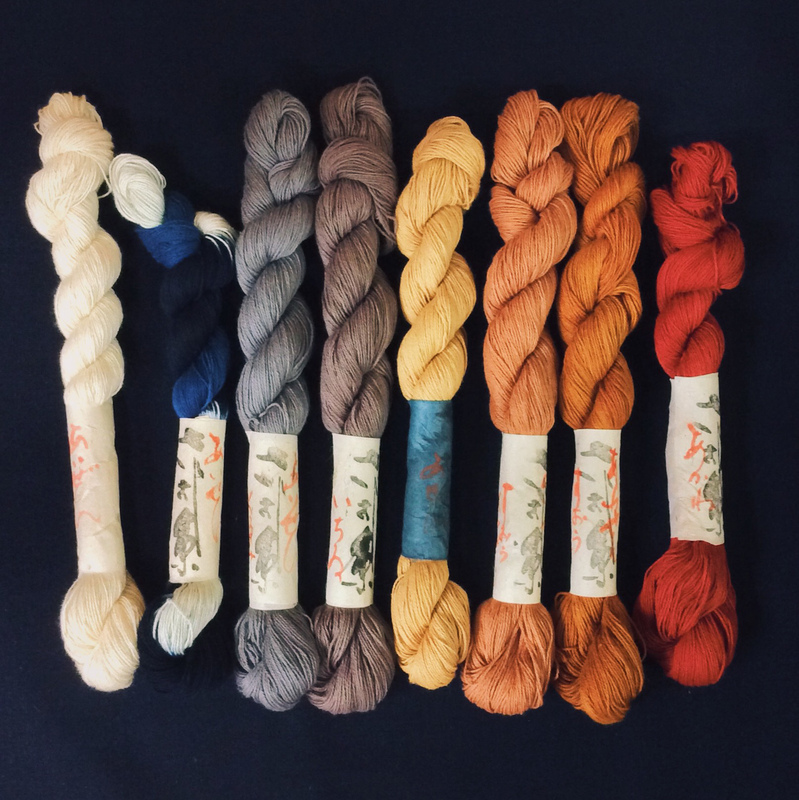 Naturally dyed Sashiko threads. From L – R: Undyed, Indigo, Walnut w/ Iron mordant, Yew, Acene, Sapang and Gardenia, Sapang and Onion Skin, Madder Root and Alkanet. The older dyer vanished after awhile as I looked at the threads so then I spoke with his son, whose English was very good, and he named all the dyes used for me, and looked them up when he couldn’t find the right translation. He was an incredibly fascinating person to talk with and we discussed the indigo dye process a little as well as the “biz” in general. He did tell me his name, but I didn’t write it down quickly enough to remember! He said there are only 5 indigo farmers left in Japan, and 5 dye houses. While from my perspective this is a bit of a fib, I am certain he is referring to the dye houses that have been around for numerous generations, that have passed their knowledge only within their families. From what I understand, knowledge isn’t typically shared outside a family or on a wider scale – the village, and taking on an outside apprentice doesn’t seem to happen lightly. He told me about their vat, they use fermentation vats, and it is a very old vat that they have kept going for a very long time. I can only assume longer than his life time and I’m guessing he was in his 40’s. He has always been an indigo dyer, and he talked about how if their vat died their business would too, because their specific recipe, their vat bacteria is what gives them the shades of indigo specific to their dye house. It instantly made me think of sour dough breads, and that even if you have a starter all the way from paris, if you take it into a new environment, the bacteria in that new place changes it, and then its not longer a french sourdough. Since it was around 5pm and I knew they would be closing soon, I asked if it would be possible to come back and see their vat the next day. I think we had a small language barrier here, as he began to tell me about how they don’t dye in the rainy season and he’d need to check the weather. (It was going to rain!) I asked why they don’t dye in the rain (thinking about my adventures of dyeing under a tarp last Spring!) and he said it is because they cannot gauge the final colour without the sun. This is something I have experienced myself, and it has always peeved me. I may from now on, no longer dye in the rain! We spent a little further time chatting, and he told me that he liked my questions. I asked what he meant and he said ” Your questions have a point, you have a reason to ask them and you aren’t just asking how we do everything. Some people come here and they just ask “what is this design? what is it called? how do you do it? We are not a school, this is our life, it is not an artform it is our trade”. I feel like perhaps my obvious delight with their work helped to grease the wheel. I didn’t visit the shop to try and steal designs, or copy them, I went to see REAL shibori. Real indigo dyed products, which after my disappointment in Arimatsu, was a very welcome sight. All in all my visit to Aizen Kobo was inspiring, eye opening, interesting and definitely worth a visit if you happen to be traveling to Kyoto. Even if you aren’t a dyer, the shop was a delight to visit, and anyone interested in hand crafts would find something there to enjoy. Well, it’s getting better every post. 200 times into the vat? Wow! Did you go back? Hi there. I was at Aizenkobo the week before you were. The textiles were amazing. Did you see the traditional field garments next to the modern designs that Utsuko-san has created? Also: Email me? I have a story for you that might explain the son’s comment…. Lived in Melbourne last year, wish I had known about your work. i went there last year as well and thought it was a very strange experience. I went to see AizenKobo in November 2014 and like you was delighted by their craft and excellence. I bought a ramie indigo men’s kimono jacket – it was very pricey. ( I am a woman.) I wore it today – I live in London. As we parked near Burlington Arcade, a young man looked up seeing me put on my jacket as I got out of the car. Her called his colleague and they both came out of their studio asking about my beautiful kimono jacket. Late someone else who understands about fabrics etc wanted to touch the fabric. I just love the Kimono jacket.